My husband and I took a trip up north in mid-February to see the ice caves on Lake Superior. We had a wonderful time, both there and on the long drive north. We traveled about 800 miles in total, and I must say; I enjoyed my time in the car due to the great audiobook we heard. 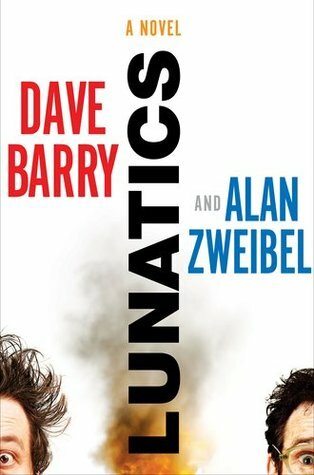 Dave Barry and Alan Zwiebel’s book titled Lunatics is a riot. I laughed most of the way north, in spite of slippery roads and lots of traffic. It is rare that I can find an audiobook that appeals to both of us. This one was a winner.The story is about two guys who meet by chance at a soccer game where they get in a shouting match over an offsides call; from there their lives are thrown together from one mad catastrophe to another. The guys are complete opposites; one a nice guy who plays by the rules and the other an arrogant “jerk.” The plot is insane. It is so convoluted and crazy that the only title possible for this book is Lunatics. Please be aware the jerk in this story has a potty mouth and says pretty much everything your mother and mine told us not to say. You have been warned in this recommendation. Drive safely and laugh yourself silly! Listening to this book now and laughing at the comedy of errors! Thank you for suggesting this, Sandy! I am so glad you are enjoying it too!